Jaguar is about to give its distinctive XJ limo a mid-life refresh, judging by these spy photographs taken by CAR magazine. This is a long-wheelbase XJL, marked out by the stretched rear door and long-wheelbase passenger compartment. You don't often see the XJ’s side-window line, dubbed DLO or 'daylight opening' in designer-speak, framed by chrome overlays. It makes it look even more LWB than normal! 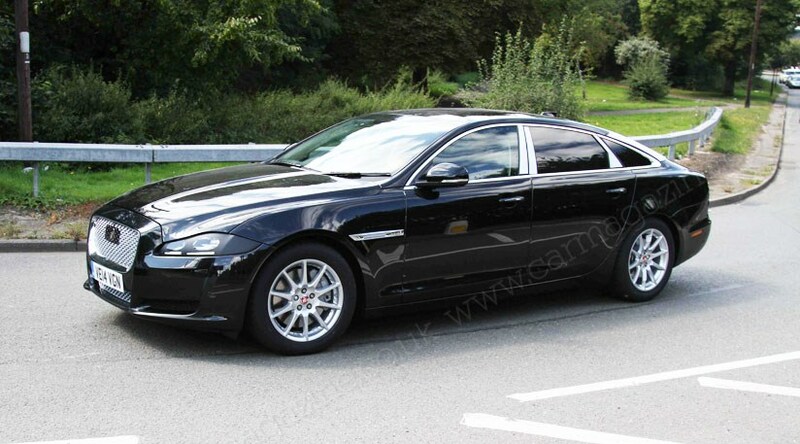 The revised Jag XJ is expected in 2015. What’s new on the 2015 Jaguar XJ? The front end of the XJ is due a facelift. We can see a new secondary air intake under the main grille, finished in matching cross-hatched wire in these spyshots. It is unclear at this stage whether this will be reserved for higher-performance XJ Supersport or if it’s a grille-for-all. Read CAR magazine's Jaguar XJ Supersport review here. Note also how the ‘growler’ Jag badge has a new mounting plinth. Our sources suggest this could house new state-of-the-art forward radar and lidar detection systems powering new semi-autonomous driving systems such as intelligent cruise control and obstacle detection. And judging by the disguise around the headlamps, we would predict a lighting makeover for the 2015 Jaguar limousine, too. It is likely that it’ll adopt full LED lights to keep up with the Audi A8 et al. And at the rear of the new facelifted XJ? Business as usual at the radical rump of the XJ. The rear lights are taped up, so we guess there’s some minor changes in store for the lamps but the rest of the back end looks very similar to today’s XJ.